In The 209, They Make Commemorative T-Shirts! 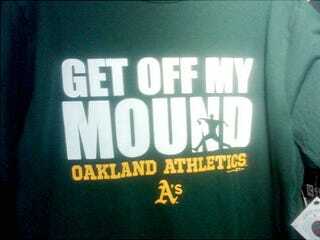 Yes, the A's are selling "Get Off My Mound" t-shirts. They were a big hit in the visiting locker room last night among the Yankees, but Dallas Braden his own self isn't too pleased. The A's team store is selling the shirts, featuring a silhouette of Braden superimposed on his Gran Torino-esque catch phrase. They would have liked to put Braden himself on it, but the MLBPA said no. And why wouldn't they? They represent the man who inspired those words, and he's still a bit more marketable than Braden. "I hope I get a cut," joked Rodriguez, as his teammates tried the shirt on in the clubhouse. They're trying to generate revenue, trying to get butts in the seats, I can see that," Braden said. "It's almost like, at what cost do you do that? They didn't have permission. They were told on multiple occasions that, no, it's not a good idea. It's not going to be approved. They just kind of put the horse-blinders on and ran with it." "It's just not cool. It's just a serious, gross lack of tact. At the end of the day, I hope I do not become associated with that kind of approach." I think it's too late for that, Dallas. You threw a perfect game, and you're still being marketed as the guy who told off A-Rod. I think that's an indictment of the Athletics' little man complex more than anything to do with you.